Celebrities hunt for antiques across the UK. 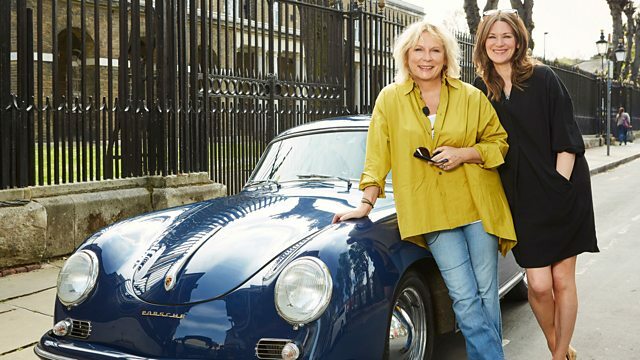 Jennifer Saunders and best pal Patricia Potter take to the road on a humdinger of a trip. Browse content similar to Jennifer Saunders and Patricia Potter. Check below for episodes and series from the same categories and more! We've had some fun, haven't we? I'll do that in slow-mo..
HORN BEEPS ..the Celebrity Antiques Road Trip. a couple of showbiz best pals. who you can see in the back. Hello, Olive, you're very close to me there. I think she's loving it. "shouldn't we do our own Antiques Road Trip?" French and Saunders, she's one of the UK's most loved comediennes. for writing and starring in the hit TV sitcom, Absolutely Fabulous. -This couldn't be a more perfect venue. -Can you hear me, Ed? -Yes, I can hear you, darling, can you hear me? She will be using microphones. -Yeah, have you got mics? and is probably best known for her time as Diane Lloyd in Holby City. if it stays cold it's real. a ceramic bowl to tell if it's been restored. Antiques Road Trip! I shall be licking all the antiques. May we come in and lick some of your wares? I'm going to go in and lick all the antiques before you can lick them. Rather you than me, Jennifer. a very nice 1957 Porsche 365. Is that all we're doing? -Put your foot down, woman! As I gather, she does various antique fairs. And, of course, she'll like you then, Philip, because you're nearly an antique, aren't you? -We haven't found a hallmark yet. our teams will kick off this Road Trip with £400 in their pockets. before heading to Greenwich in London for auction. Oh, look, a Porsche 356. -Hello, this is very exciting. Good to see you. I'm glad it's got brakes. Look at Olive. How are you? My name's Mark. Lovely to meet you. Mark, I'm working with Olive. I have. And you've got a blue car, and we've got a red car. -This looks lovely, doesn't it? -Right, I'm going to be good. -Got a bit of experience now. -Do you know what I'm most pleased about? Olive in the back there. Olive, how are you? I feel we've got a slightly better car. -I think we've got a better car and a better expert. I wouldn't let Phil hear you say that. Jennifer and Phil are heading to Hare Hatch near Reading. When did you discover that you can make people laugh? Well, I think it was probably at home. We used to laugh all the time at home. My dad was funny. if you're going to sit down and have a meal together, you crack jokes. So I think I had quite a good upbringing for that. And then at school I never did much. got the complete bug and it is a bug. it's like the world changes. You go, "Thank you, I know what I want to do now." what you've imagined, how does that work? Do you throttle them? -No, I have been known to do it for them. "Listen to what I'm saying and this is how you say it." -"Why don't you just do it for me? How'd you want it done?" "Oh, OK," and she'd do it. -It's professional, it makes it easier. Yeah, it makes it much easier. That should help with keeping Phil in check, then. Jennifer, Phil and Olive have arrived at their first shop of the trip. Do you think we've got an unfair advantage with Olive? That's true. Come on, Ol, in we come. all three of them get stuck in. That looks like every Elizabethan comedy set I've ever been on. Oh, it's something I can lick. This is an occasional table. Sorry, "occasional table" it says there. It always makes me laugh when they say occasional tables. -I'm not sure what they are. it looks like Jennifer has uncovered something interesting. Oh, no, there's something that was once alive. -Something that was once alive. Something that still could be alive. Oh, that's cool, isn't it? I know where that's going. -It's not going on my head. -No, I know. Go on, then. -Do I look like Rumpole? Look, we've got his little stock, whatever it's called. Little collar. -With all the... And his collars. -It's seen better days, the collars. But this is a nice tin. I like that. Do you like that? I think that's really nice. It sports a price of £68. Is there a deal to be done with Nigel? Er, well, the tin is certainly Victorian, I would've thought. Yeah, I think you're probably right, yeah. We're going to need to give you £40 for it, really. Because it's going to make £50-£80 at auction. You're not going to get there at 40, I'm afraid. You will get there at 55. See, we're nowhere near you at that, I don't think. We're just going to lose money there. Well the best, and this is the death, is 50. Are you willing to part with £50 for the Victorian wig and tin? Listen, we're going to have fun with that wig. Actually, there we go, thank you very much, indeed. -Thank you. And onwards, sir. -Thank you, Nigel. See you, bye. So that's Jennifer and Phil bagging their first lot. Patricia and Mark, meanwhile, are making their way to Reading. Did you enjoy working on Holby City? I loved it. What a great job. And you know a lot about medicine? -I know nothing about medicine. I married a doctor. -Oh, you married a doctor? I married a doctor, my lovely Jim, who is doing... We met doing Holby. That's another great thing about the job. You met your husband on Holby. What was he doing? -He was doing medical advising. Only to meet girls, yeah. a visit to the Royal Berkshire Medical Museum. treated thousands of injured soldiers. unidentified bacteria by using his nose. and museum volunteer, Tom Dehn, to find out more. like for the soldiers on the front line? Pretty miserable on the front line. injuries occurred in really desperate circumstances. objects had been forced into their flesh by the impact of the shrapnel. and really the only treatment for gas gangrene was amputation. have cost them their lives. The lucky ones were sent back to Britain. is here to tell Tish and Mark more. had the characteristic smell and they did animal experiments. showed that it could help wound healing. into the wounds of patients, and it worked. It was what's called a proteolytic bacteria. It broke down tissues to enable proper wound healing to take place. technique and probably shortened their time in hospital. all thanks to his nose and the discovery of Reading bacillus. to Eversley in Hampshire, where they're arriving at their next shop. This looks rather gorgeous, I must say. Out you come. I thought you might stay in, but no. is a wide variety of antiques, furniture and collectibles. -Hi, Hilary, nice to meet you. -Hilary, we've met, haven't we? -We've met before. Nice to see you again. And what a very good lady Hilary is, let me tell you. -Shall we go and have a look round? Is that all right? -Those are nice, mind, the little lions, Jennifer. I tell you what's nice about the lions is that they're weathered. -They've got a nice look to them. -How much is on those? They can be 40 for you. and it looks like Phil's found something else. -a little coffee table, wouldn't it, like that? -Put a tray on it. -It's got to be 50 quid, hasn't it? I think it's got to be slightly less, I have to say. -I do like this lady. -I do like her a lot. What do you think about that if we could get that at 40, do you think? -40? 40, I'd go for it. -Could you do that for 40 for us? Halfway - 45 I'll do. -It's up to you, my love. -We'd like this and the lions. -That at 45 and the lions at 40. -80 the two would be better, wouldn't it, really? -Cos it just makes the maths so much easier, doesn't it? Yeah, that'll be all right. 80 for the two. and the Georgian-style luggage rack for another 40. Upstairs, some feathered friends have caught Jennifer's eye. -Those are fun, aren't they? Well, I think they look really nicely done. -Would there be a lot of movement on price on these? I can always make a phone call. How much is on them? -245, that's quite a lot. -Well, I'll go and ask. only to find he won't go any lower than £200. -200? No, we'd be poles away. and look who's turned up. -They're here! They got here before us! -This is not fair, is it? I can't believe you got here and you've been buying stuff. -I'm desperate to go inside. a single thing with their £400. I don't know where to start, I really don't. So, what we want is something that really stands out. Stands out, quirky, something that's fresh to the market. It's completely overwhelming. There's so much stuff. their rivals are on a roll. -Do you want to win? -Don't offer me the bedpan. -How much would I pay for it? -You'd pay 50 quid for it? something like 50 quid for that because it's quite a nice one. probably even £30 they'd be happy with. -Did you hear that, Jennifer? -They'd take 30 quid for it. -Selling it for a customer. -We can't walk past that. -I think, for 30 quid, that's not bad at all. -but I don't think so. -We can't walk past that, can we? becomes their fourth lot bought. Still to spend a penny, Tish has found something she fancies. -Now, what do you think about this? -Oh, gosh, I need to sit down. -What is it? Show me. -So this is a scrapbook. -first of all, it's enormous. It's got space within the pages to take its full form. What do you think? It's only £30. -what do you call this, oxblood leather? -You don't see that any more, do you? It does match our car. I think this is not a bad buy, you know. A lot of the market these days is to do with decorative items. It's only £30. 20... Do you want to try and negotiate on the first item? -I'm a bit nervous now! -OK. Let's give it a go, let's give it a go. Go on, Tish. Work your magic. is £30 and I was wondering if that was the best. Normally, I'd say 25, but you are in a competition so I'll say 20. -Oh, you didn't need me, did you? She secured the late Victorian unused scrapbook all by herself. -Is that a little miniature staddle stone here? -That's nice with the lions. -Oh, please, let's do that. -I don't know how much is on that. Can you see it? -Can you do this as 40 as well? alongside their lions to make one lot for auction. the other team turned down. I need to look at these. The thing with these is they're made about 1890/1900. -who made the best quality ones, called Franz Bergman. And he used to sign his initials in a little urn with the letter B. The thing is that cold-painted bronze are very collectible. -Do you honestly think that these would sell? -I have to say, I think they're absolutely hideous. Well, absolutely hideous can sell, you know. He's not wrong. And Mark reckons the birds are worth a punt. OK. Now, Hilary, we've fallen in love with these two turkeys. The dealer has already said he'd take £200 for the turkeys. Can Mark sweet-talk him down a little lower? My lovely celebrity, Tish here, and I have fallen in love with these. you might just tweak them under the 200 for us. 195? And I can't tweak you to a round 190? 190. Oh, Brian, you're such a star. Thank you so much for your time. And thanks from Tish, too. but that's the bronze turkeys bought for £190. And so ends a busy day of buying for our weary celebrities and experts. Olive and our antique-hunting actresses are back on the road. -How was your day yesterday? How did you find everything? -I was livid that you got there before us. Cos there was a couple of things that I thought, "Oh, I love those." -which you don't like, I don't think. -No, I really think they're hideous. Oh, no, you see, I love a cold-painted bronze. -We did see the turkeys, yes. -I thought they were great. Well, that's a little awkward. leaving them with £195 to spend today. which means they still have £190 available to spend today. Mark and Phil have had a bit of car trouble. The girls, meanwhile, are oblivious to the boys' predicament. -I think we've taken a massive risk on one of our items. -Oh, I wish I knew what it was cos I was in that shop. I know. Well, I'm not allowed to tell you. -I'm sworn to secrecy and I'm finding it incredibly difficult! The boys have arrived and poor Phil looks puffed out. Mark, you meanie, I hope you don't expect Tish to pull you, too. I only noticed you when you got your leg out. -How are you this morning? -He did, he broke it. -Nice to see you, you look wonderful. -I didn't break the car, it broke down. -While you were driving it? -There's something wrong with it. -What are they going to do? When you said, "What are THEY going to do?" What are THEY going to do? Cos we've got the car. -We could come in the back. -Oh, come on! Olive struggles in the back. -You're not even going to let us have the car. -We'll see you later on. -They've already had a head start. This isn't fair. -Life's full of unfairness, isn't it? I don't know what you're going to do. -I think we'll start walking, don't you? -You've got good sturdy legs! You do know the real bonus of this, don't you? -Well, we're going to be there an hour before them. -What's been your worst corpsing moment on stage? -Once, Dawn and I were shooting a sketch with Stephanie Beecham. And we got the worst giggles, I mean, ever. "That's fine, that's absolutely fine, ha-ha-ha,"
-I could see on her face and that made us laugh more. including the director, was going, "This is no longer funny. -"You have to do this now." And it just made us go even... It became unprofessional. and we should have been drummed out of the industry. Well, we're very pleased that you weren't. armed with a car, Jennifer and Phil may get first dibs. I tell you what, you bought one, I bought one. I think it's Olive's turn. Do you? -Let's see if she can sniff something out. -See if you can sniff something out, Olive. -I wonder if they find bones. It's antiques you're after, Phil, not bones. Jennifer's spotted something she likes. to this little chair. Oh, that is so cute. I quite like that little kids' chair. I think that's rather nice. And it is only 12. Get that for a fiver. I think that's... I'd love that little thing. -I'd definitely, absolutely get that. I think that's a cracking little item. Have they got any teddies or something? Like you sit the teddy in it and sell the teddy in the chair. -And he's not brand-new, either. -Put him on the chair. Tish and Mark are ready to browse and raring to buy. -Can you point us in the way of the bargains? -You're not going to even stop and say hello? -Have you bagsed everything good? -Oh, you lot, the oppo! Where's my oppo? Is she downstairs? -She's gone roaring past us. -You're in here first again. Honestly! -Oh, you know, it's just the way it goes. -Well, we've got to shop, Phil. -We haven't got time for idle chit-chat. "Bad luck," he said. Isn't that nasty? They're the best of friends, really. Right, you two - what can you find? Oh, that's nice. It's Mason's, isn't it? that there's quite a trend these days - macaroons. And people like a cake stand. -We'll probably get it for a tenner or something. You don't think it'll make any money? I don't think it'll make a huge amount. Well, best put it back, then, Tish. -Did you see that old tin? -Well, it's an old hat box. I thought it might go with our wig box. Aha! It looks like a lot made up of tin boxes might be on the cards. -Well, now, that is a cute thing. Look at that. It says it's for tapers. "Price's...dropless white tapers for lighting candles." there's a few tapers in there. There's not four candles in there, is there? -That's a nice thing. It's got possibilities. It's got 19 on it so I think that's a bit steep. Oh, she's a tough one, that Saunders! -I love it! I love it! -Of course, it's not an antique. -It's a statement piece, isn't it? Yes, it's what you were saying that you wanted to find. I mean, they've called it a log basket, which it could be. -It could be a log basket. I would have that in my house. Or if you like a bottle of wine, of course, it could be an ice bucket. You know, have your champagne in there. -How much is it on for? -Oh! We've got to get this. so dealer Suze called the owner to find out how low he'll go. -Oh, well, Suze is here with the decision. -Well, the answer was £20. -Listen, you're a miracle worker. Thank you so much. Tish and Mark are very pleased with their purchase. -I'm delighted with this wonderful thing. Now, it's Jennifer's turn to get her haggling hat on. Can she strike a deal with Nicole and Maddy on the hat and taper tins? So, you've got 22 on that and you've got 19 on that. What's your best price for the two? I'll take £5 off so it'll be 14. -I can see your face. -Well, I'd like to pay £10. -You can have it for ten. So, how do we negotiate with that? So, usually it is 10%, but I'm sure I can let you have it for 15. -That's not bad. Come on, Phil. -I'd have the two for 20. Can you do the two for 20? and this bear at 14. -Right, again, they're not mine so, erm, the chair can be eight. And the bear can be eight as well. -If we can do 15 and 20, we'll have them. -Oh! You're fantastic! Thank you! So, for £35, Jennifer and Phil have bought four more items. And that means their shopping is complete. -Right, I think we've done very well. -And well done, you, Olive, too. have made their way to the historic market town of Hungerford. it's home to Kimmer Antiques. but she's spied something interesting outside. Now, why do you like this? Because I love the proportions. I love a child's chair. You know, the really good ones go for hundreds and hundreds of pounds. -I mean, this doesn't seem to have a price on it. Do you know what style of chair we call this? -I'm... I know I should, but I don't. -It's called a Windsor chair. -And it's a very, very English design. 1730s and onwards and they've been made ever since. that this isn't a particularly high quality one. -And it's not old, particularly. -Do you think it would sell? a charm about it, hasn't it? Time to call on dealer David. David, now, what sort of price is that, David? Can we start off around £80? but we're going to end an awful lot lower. -What do you think, Tish? by my expert and I'm going to offer you, David, £20. I could do 30 for you, Mark. I think you're being very nice to Tish and I. What do you think it'll make at auction? Do you think it'll be OK? I think it'll be very OK if we sort of shook hands at 25. -Would 28, Mark, suit you? 28, yes, I'm taking over this decision! -Don't drive him any lower! -It was a pleasure, sir. I want £3 off for shaking my hand! -28, thank you so much. -That's wonderful, thank you very much. That's the little Windsor chair for £28. Meanwhile, Jennifer, Phil and Olive have made their way to Newbury. for inventing slapstick comedy, music hall impresario Fred Karno. is Karno historian and biographer David Crump. around 1888, but he literally took the music hall by storm. it didn't matter who was in the sketch. trained them and then they were cheap. Charlie Chaplin and Stan Laurel. They both joined him at about age 18.
and he was the star of Karno's sketches at the time. Sid encouraged Karno to give his little brother a chance. thought he was far too puny and too young to do very much. He brought him in, gave him a go and he developed slowly as a comic. Stan Laurel joined about the same time, they were a similar age. -getting stolen by the pictures. -So, he sent the little brother. So, they went on this ship called the Cairnrona. This is Chaplin in the centre. This is Stan Laurel. -He already looks like an old man! -His hat's, like, that big. -So, he was, I think, about 21 then. Both Chaplin and Laurel held Karno in high regard. "and me all we know about comedy - he just taught us most of it." Ha! he directed them, he was in them. -He even ended up buying the company that printed the posters. He ended up running the theatres. and Stan Laurel was the same. behind Laurel and Hardy and Chaplin, of course, was exactly the same. including the 1923 silent movie The Pilgrim. imaginative and well put together. for slapstick comedy, which was nurtured by Karno. and the most important comedians of the early 20th century. and put all of his money into this hotel and he basically lost the lot. And it was also the time the First World War came along. After the First World War, I think people wanted something different. having gone from that absolute superstardom, yeah. He is credited with inventing the custard pie in the face gag. You always want it to stick to the face, too. The consistency's got to be just right. The consistency's very important - weight and consistency. That's good. What was that? That was quite good. Well done! Oh, no, thank you so much! I'd run if I were you, Jennifer! I'll just put my glasses back on. Well, at least Olive's having her lunch. Meanwhile, Patricia and Mark are still shopping in Hungerford. hoping for some final lots to take to auction. -Oh, I can't bear it! This is absolutely my kind of place. there's sure to be something to tickle Tish's Road Trip taste buds. I can't see a price on it, which is a really bad sign. It probably means it's incredibly expensive. Mark's off for a snoop around the stock room with owner Stewart. Oh, my gosh, it's like an Aladdin's cave! Is that a car mascot? -I imagine it is cos of the central bar in its mount. It'll be brass, actually, looking at the colour of it. -You can see that on a nice car, can't you? -That's Art Deco, isn't it? I mean, the shape of him, he's quite angular. -I think I've got to show my celeb partner, you know. -Yeah, let's take that out. -I love this iron boot scraper. -Oh, you know what it is! You see, you've got an eye, haven't you? You're absolutely right. that people would be keen to buy. Well, it's a period one, late Victorian, I would have thought. but I've found something as well. Have you? What have you found? -I've found a car mascot. -Oh, I love him! A little Staffy! It's a Staffordshire bull terrier, isn't it? But can you see the traces of silver? so it really would have shone out. It's a really nice colour without the chrome, isn't it? And if you think of chrome, what period do you think? No, and there's no price sticker on yours. This could be a disaster or it could be really exciting. -Shall we call Stewart in and find out? Right, Stewart, what's the damage? Well, I could say £200 each, couldn't I? I'd almost frighten you away. -We would say, "Thank you very much and goodbye." Erm, I was thinking 50 the two, actually, to you. 50 the...each. Oh, I like 50 the two. I really like 50 the two! -That was a slip of the tongue. -We won't hold to you to that. -Sorry, 50 each. So, that's £100. But if we were going to buy them together, would you knock a bit off? Could you possibly stretch to 80? -Yes, of course he can. -£90, I think, is the best. but we'll leave it at that for the moment. -Don't, he might change his mind. I think that's a good deal for you two. I think it is a good deal, it's a very good deal. -Thank you so much, Stewart. for 50 and the boot scraper for 35.
ready to reveal what they've all bought. -We're dying to see this. OK, I'm really envious of that. -I do love the... Is it a luggage rack? -Those are very in now, you know. -Well, that's what Phil said and I'm relying on him. -Oh, that's nothing, is it? -That has grown on me so much. -I love it, I love it. -And look at the quality. -I'm really envious of that. -What do you mean, "eurgh"? It's not a dead thing. Because people were barristers and they wore wigs. They don't want to get new ones, they want to clean up old ones. and you're going to buy some ratty old thing? Then we have a job lot here of bear and chair. Chair bear! I'm completely obsessed with your collection of stone here. -And I love the corner cabinet. Yes, this cabinet's the money. This is the sleeper, this is the sleeper. -I think Olive's the sleeper. It's Tish and Mark's turn. Time to reveal those turkeys. Brace yourself. -I felt so guilty about it. -Is she a friend of yours? OK, the important thing is, how much did the turkeys cost you? What do you think they'll make? I think they might make £400-£500. -I like the boot scraper. -Good, that was my choice. -I love the boot scraper. -The little chair, I'm quite jealous of. I think, seriously, the only thing you're going to lose on is this. I don't think we will, you know. Cos it's a good interior design item. I am quite cross about the turkeys! No, but I won't be cross when they lose a lot of money on it, Phil. -It's a risk. I think it's honestly a risk. -I think it's a risk. isn't it, to get our revenge? I think we've got a couple of sleepers. I'll give you a head start. Ready, steady, go - off you go! So, out of earshot, what did they really make of each other's lots? I think they were a bit peeved about the turkeys. Oh, I don't know why you would get that impression. I couldn't believe those turkeys, could you? -I was envious of the stone lions. I think they're great for a London flat. -If you've got a small garden flat, perfect. -They could make money, actually. -Oh, I love that. It's so cool. It's a log basket, it's whatever you want. I think Jennifer is quite disappointed she didn't buy them. -Yeah, I think so, too. -I just hope we don't get stuffed. towards Greenwich for the big finale. I'm going to lick every person that's in the auction house. I'm going to go up and lick them! "I think you may have been restored." I think they've lost it, myself. where Mark and Phil are waiting to greet the girls. -How are you, lovely? Are you all right? -Hello, are you excited about this? It's auction day. -Are you excited about this? -I'm very excited. I can't wait! -Let's go in, let's go in. so what does he make of everyone's lots? then you've got a chance of a sportsperson buying them. but someone's going to use it, aren't they? Are they going to be a turkey? I don't know. costing them a total of £240. The opening lot is Tish's little Windsor chair. Bid's with me at £20 only on that chair. Looking for 22, 22, 25, 28, 30. Two, five I need. It's £3. Go on! 35 there, at eight over there, looking for 40. Are we all done at £42 only? That's only £10 a leg. Are we all done at £42? A solid profit to start with. Great stuff! -We're really, really pleased for you. -I can see that, Philip. -Really, really pleased for you. £30 I've got, looking for 32. Are we all done on that table at only 30? 32 there, looking for 35. 32 I've got and I want £35, worth all of that. Are we all done? Cor, that Robert's a bit handy with the gavel. But that's a loss for Jennifer and Phil. Philip, you've said that once already. Don't be bitter. Not much(!) Next up, it's Tish's Victorian boot scraper. Straight in with a big £15. 20 with me, looking for 22. 28, 30. Two, five, eight, I'm out. Yes? 38 there, looking for... £40 standing. Are we all done? 42 there. 45, 48. I feel absolutely kippered here. 60 I've got, looking for 65. Are we all done? Are we all done at £65? Another money-maker there for Tish and Mark. -I want to go shopping with you more. with their trio of tins, including the legal wig. Looking for 35, 35, 38, 42, five, eight, 55, 60, I'm out. 65 I want. 65, 70. 75, 80. 85, 90. 95, 100. And ten. 120, 130. 140. -I said it was asleep and it woke up. 160. 160 on the telephone. 190 on the second phone. He looks so sincere, doesn't he? Hey, Jennifer predicted the tins and wig would fly and, boy, did they! I'm very pleased about that. Do you know what it was? The tapers. of Tish and Mark's toleware bin next. The bid's with me, straight in at only £25 on that. Looking for 32. Where's 32? Five with me, looking for 38. Are we all done at 35? Are we all done at 35? 38. 40 with me. Two, I'm out. £42 in front, looking for 45. Are we all done? Do you know what? I thought they'd make a lot more than that. Still a great profit, not to be sniffed at. Catch up with the wig, with Wiggy Wig over here. and Jennifer and Phil's Georgian cupboard is up next. And the bid's with me, straight in at £45. You're £15 in profit already. 45. Eight, I'm out. Looking for 50. Are we all done? Another tidy earner for Phil and Jennifer. -Well, that's a bit of a profit. -A profit is a profit. Wise words. Time for Tish's Victorian scrapbook next. And the bid's with me, straight in at only £22 on that. -25, eight, 30, I'm out. Looking for 32. £30 I have, it's worth more than that. I've got 30. He's going to steal this at 30. Two I've got, five, eight. 38 there, 40 I want. 40 I've got. Yes, we've doubled our money again! The profits are flying in today. They've still got to make money on the turkeys. Nobody would want to buy that. Next, it's Jennifer and Phil's staddle stone and lions. I've got 40, I want 42. Five, eight, I'm out. £48 on these. -I'll get my mother to phone in. And 60, sir. 60 in the middle of the room, five I want. -And 70, why not? 65, I'm looking for 70. Go on! Jennifer, you've got to work this. Get up, Jennifer! -75, on the phone at 75, looking for 80. 75, looking for 80. 75, looking for 80. A disappointing loss, there. Hard cheese! I was so determined not to lose that much money. this time with their Art Deco brass car mascot. It's got to start with a bid with me of only £40 on this. 42 I need. I've got 42, five here. Looking for 48. -60 with me, looking for 65. That's 70 here. Looking for 80. Are we all done? The doggy's done good. Great profit there. So, this is turkeys v chair. Turkeys v chair and bear. Let's not forget the bear! Who could, Jennifer? Here we go, it's the children's chair and bear. Straight in at only £42. Hello? Anyone out there? 45 I want. Anywhere... 42 with me. 45 I want. The lady's here. 45, 48, 50, five out there. Looking for 60 on this, I've got 55. -That was a better profit. -Actually, you've made a good profit. Jennifer and Phil are in the lead. those Bergman cold-painted bronze turkeys. Will the crowd gobble them up? Looking for 95 on these two birds. I've got 95. 100. 110. 120. 130 I need. 130. 140. 150 I want. Second phone is 160. 170. 180 I need. 180. 190 I need. 190. 200 he needs. £200 on the second phone. -I really want these to do well. -Well done, Stace, well done. Well done. On Louis' phone, 240 I want. 20 and 250. 250 and 260. -260 I've got. 270. All done at 260? -270. Back of the room. 280 I want. 280. 290 there, looking for 300. You're going to do it. 310 in the room, 320 I need. -I should have let you buy these, shouldn't I? 380, looking for 390. 390, looking for 400. 410 in the room, take 420. 420. 430. 440 I need. 440 on the telephone, is it? I've got 430 in the room. Are we all done? That is an absolutely terrific profit! Jennifer and Phil must regret not buying them. They started with £400. making a very impressive £226.08 after auction costs. -Well done, Stace. Well done, you. -I am competitive, I have to say. Just some have won bigger than others. There are no losers. There are only winners here. That's what all good losers say, Jennifer. Ha! Let's drive off into the sunset. -I'm going to miss this. -I'm going to miss it. Can we just do this all the time? -I'm going to miss Phil and Mark so much. -It has been the best fun. It's been marvellous having you. Toodle-pip, girls. Comedy legend Jennifer Saunders and her best pal, top actress Patricia Potter, take to the road on a humdinger of a trip. Joined by veteran antiquers Philip Serrell and Mark Stacey, they shop in Berkshire, Hampshire and Oxfordshire before heading for an auction in Greenwich, London. Jennifer and Phil detour to hear about Fred Karno, the man credited with inventing slapstick comedy. Meanwhile, Patricia and Mark learn how a surgeon from Reading used his incredible sense of smell to successfully treat soldiers injured in World War One. And, Phil gets custard pied - what is not to love?